We are getting asked more and more to style homes in the Mid-Century Modern Style. What isn't to love about this style. You get clean lines, a splash of color and some fun fixtures. Here are some elements of creating a Mid-Century Modern Bathroom. When looking for a vanity you have several options. You can either do a free standing vanity or you can look for a floating vanity. Some of the key elements in looking for a vanity is the type of wood, fixtures and shape of the vanity. Walnut is a very popular wood type right now and looks impeccable with the mid-century modern look. Look for either clean lines when picking a vanity or something with a fun shape like the last option in the photos. It adds a little more dimension and catches the eye. Just a few tips when picking a vanity. You can either just buy the vanity as is, or sometimes some companies that sell vanities will include the counter top and the sink. The final decision will come down to your budget and what you want for your overall look. If you want a top mounting sink probably not wise to have it all included, or if the company selling the vanity doesn't have the exact color counter top you want. So just pay attention to those details. Have you always wanted to add a fun patterned tile somewhere in your home? Well for a bathroom in the mid-century modern style I give you full permission. Now where you put the tile is up to you and what you want your overall look to be. You can either put it on the floor and keep the shower/bath tile very simple or you can add it your shower/bath surround and keep the bathroom floor simple. What is great about using a tile like this especially in the bathroom is that it won't be too overwhelming for the space and it can be super fun and playful. Or instead of using a fun patterned tile you can use a textured and colored tile. With this tile you can do a few things with it. You can add it to the shower/bath surround or you can go up the wall behind the vanity with it and it can be a fun focal point. I've seen some bathrooms where they have added a neutral hexagon that is smooth and flat to the bathroom floors that can be fun as well. But I would stay away from adding a textured tile to the floor. Here is the infamous white tile that we see so often in the mid-century modern style, I had to add it in here but I am showing you what else is out there than just the plain white subway tile. Don't get me wrong the white subway tile has it's place but I like to change it up a bit. Here you get the white tile but these tiles have dimension and texture, which in a small space like a bathroom can really help make it unique. With these tiles I would either do the shower/bath surround or do the wall behind the vanity to make a statement. This white tile pairs perfectly with the patterned fun tile I first showed you. Adding vanity mirrors can sometimes be a challenge due to finding the right style or size. Standard size for a vanity mirror is 24"x 36." But each space is different so you will have to be the judge on what size is good for your space. I picked these mirrors because they are super fun and I love the shapes and the flair that they have. Lighting for the bathroom can be super creative and playful. 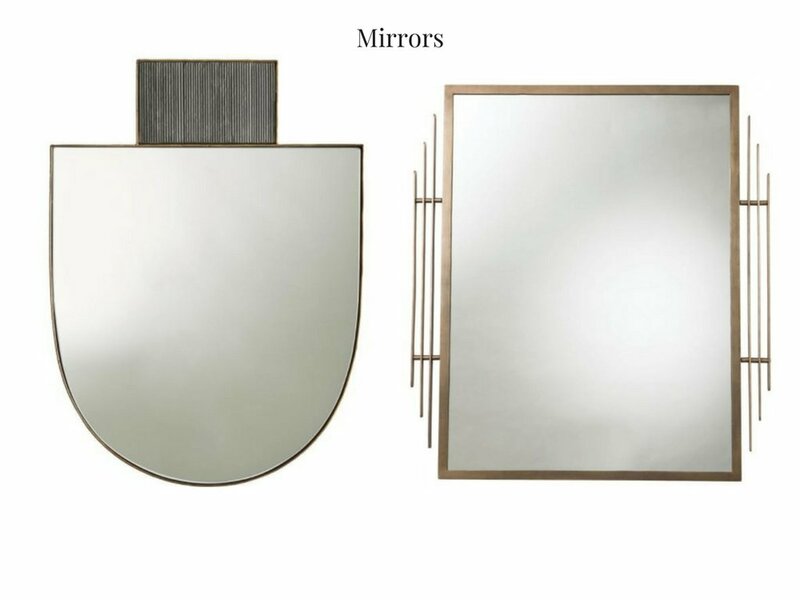 There are really only two ways you can apply sconces around the vanity mirror. The first is getting one sconce that can be horizontal and hang it above the mirror. Or you can get two sconces and hang them on either side of the mirror. I picked the following lights because of the shapes and the variety of clear or frosted glass and of course because of the bronze finish. And if you are going with the white scheme the bronze is warm and pops really nicely against the white. Now if bronze is too much for you, it is perfectly fine to go with a satin nickel. I've added some fun rugs to this because sometimes if you go with an all white schematic you can add color with a rug. I'm not saying a huge rug just a small 2' x 3' or even a runner if you have a long skinny bathroom layout. I've even added a fun sheep skin if you go with the patterned floor so that you don't compete with the pattern. Remember if you get a wool rug, it's super durable and easy to clean. Hope this was helpful so that you can create your own version of a Mid-Century Modern Bathroom.